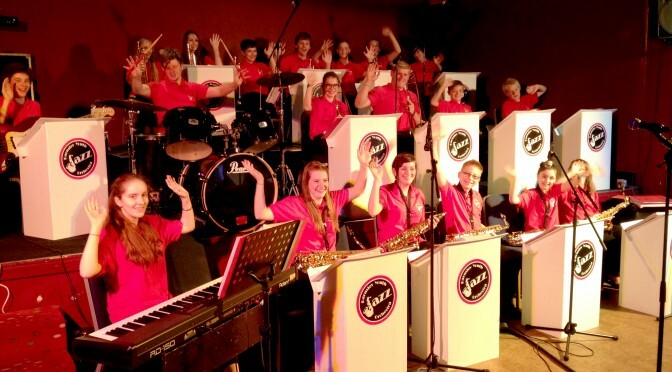 This is a concert for both the Jazz Orchestra and the Swing Band. This concert is open to everyone and is being held in the Scarlett Room. Families are encouraged to come and watch, entry is by donation. If you don’t have enough time to go home and come back then there is a bar and a comfortable foyer where you are welcome to wait until the doors open. The address is: Holiday Inn, Barnsley Rd, Dodworth, S75 9JT, which is just off M1, Junction 37. Both the Swing Band and Jazz Orchestra should be proud of their performances tonight. The room was packed to the rafters, and the music was enjoyed by all. Each and every one of the kids had a smile as they gave their best to the audience.